After weeks of anticipation the hatching eggs arrived at our local post office. Our postmaster is probably thinking “what’s next after bees and chickens?” At least they are getting less dangerous. Upon their arrival, Dad got them established in their new home (for the next 21 days, give or take a few), a Brinsea Mini Advance Incubator. 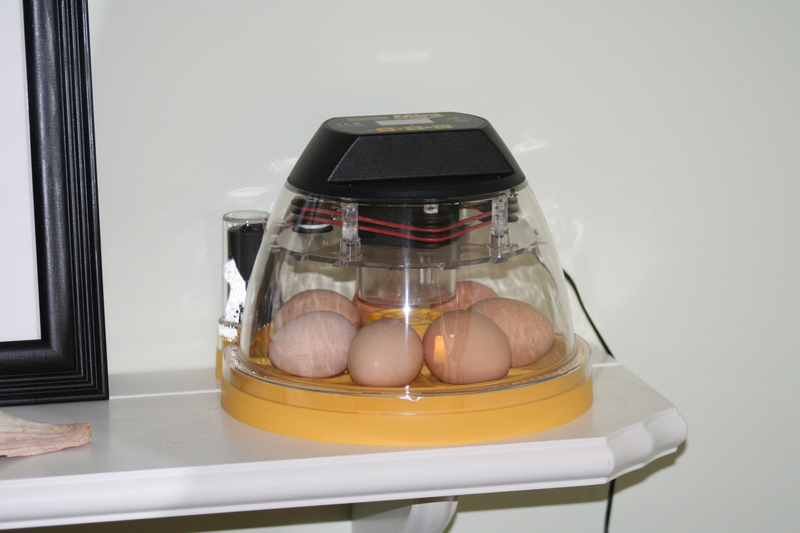 This incubator provides automatic egg turning with auto-stop two days prior to hatching, a countdown to date of hatch, and temperature alarms. Fancy, fancy. I am excited that we went with hatching eggs, instead of day-old baby chicks, as I am now part of the experience from the very beginning. 1. Excitement and reconnection to the lift cycle: The hatching of baby chicks is a cycle of life that was once familiar to most people, but that we are now divided from. Many people picture chickens as dirty, smelly, stupid creatures whose only purpose in life is to produce food. That mistaken idea is difficult enough to countenance if you have ever kept chickens yourself, and even more so if you have raised them from baby chicks. However, starting your chickens from eggs brings that disconnect into even sharper focus. It will be interesting to see the results of starting with hatching eggs. Shipped eggs are more difficult to hatch then eggs from your own flock or from eggs acquired locally; how the eggs were handle during shipping can greatly affect the outcome. Also, another end result that must be taken into consideration when hatching eggs is that some of the eggs will most likely be roosters, or all the eggs could be roosters. Multiple roosters can cause numerous issues such as overbreeding of hens and roosters fighting upon themselves.